Eighty-two years ago, CBC Radio started broadcasting, aiming to give as many Canadians as possible something good to listen to. 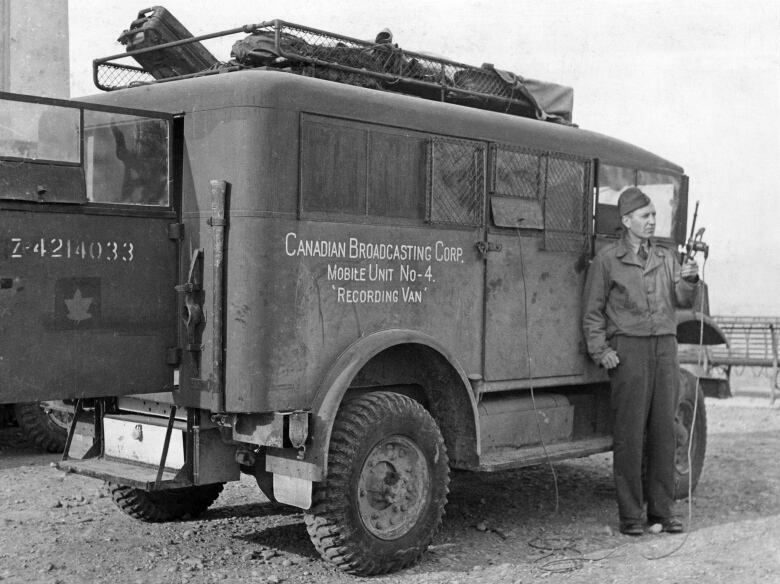 A new era in Canadian broadcasting began 82 years ago, when the CBC came into existence on Nov. 2, 1936. Leonard Brockington, the chairman, welcomed listeners in this broadcast recorded two days later. Speaking of the "ideas and ideals" discussed at the first meeting of the corporation's governors, Brockington laid out the two main tasks of the CBC as "to afford as many citizens of Canada as possible ... the opportunity to listen," and "to see that they can listen ... to the most acceptable programs." Here, from CBC Archives, is a glimpse of some of the programming from the early days. 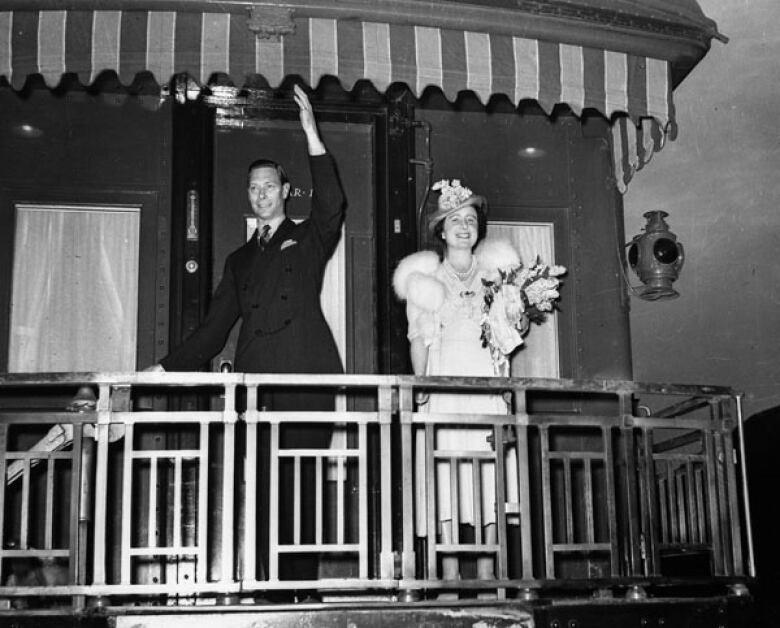 Fewer than three years after the CBC's birth, King George VI and Queen Elizabeth toured Canada by train for six weeks beginning May 17, 1939. The CBC was there, bringing listeners a daily account of their activities, with rebroadcasts every evening. On May 20, for listeners at home, it was almost like being there after the King and Queen unveiled the National War Memorial in Ottawa. A nearby CBC commentator surveyed the reaction and captured the sounds as the smiling royal couple unexpectedly plunged into the crowd of First World War veterans, shaking hands and chatting with the soldiers. 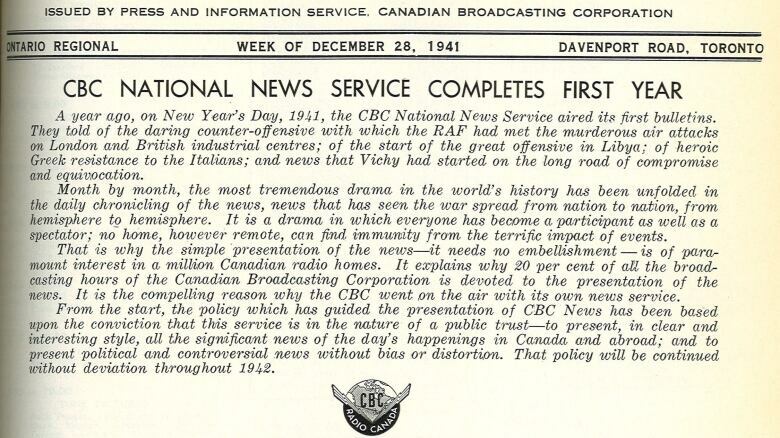 An article in the program schedule for January 1942 justified the dedication of 20 per cent of broadcasting hours to news, due to "the most tremendous drama in the world's history" unfolding "in the daily chronicling of the news." "This is the morning we waited for," Halton told Canadian listeners back home. "A morning in France, a morning in which the fair fields in Normandy are torn and ripped and split apart." 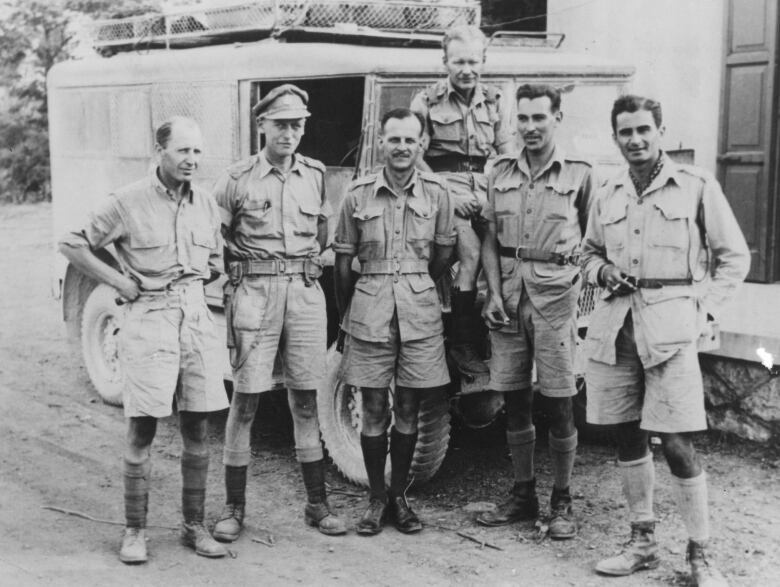 The 1941 annual report of the CBC detailed the establishment of the news service, the achievements of the overseas unit, as well as the host of "talks" and music programs broadcast by the CBC. But there was also attention paid to the area of "Variety and Light Entertainment," because "the lighter and more humorous side of entertainment has not been forgotten." Fireside Fun is a perfect example of such programming. In the Friday night program, the announcer summed up as bringing listeners "a wide variety of suggestions for things to do at home ... and to thus help you in the saving of gasoline, tires and money." In this brief excerpt, Toronto dance instructor Cecil D'Costa spelled out the importance of having "a parlour stunt that will keep the party humming" because "every member of the party likes to experiment with tap dancing." Other episodes in the series promised to teach soap carving and how to start a glee club.